Water. You either love it or you have an app to remind you to drink AND refill your water bottle (we’re guilty). As much as we don't want to hear it, water and proper hydration on a daily basis is essential for general mental and physical health. So why is it so difficult to knock back 8 oz of water a few times a day? For most of us, it's, well, boring. With the hundreds of sweet juices, variety of teas, coffee, and other flavored beverages it's easy to feel “hydrated”. While yes, water may be an ingredient, the often crazy high counts of sugar both natural and artificial almost counter the act of hydrating. We’ve all heard the general rule of thumb; “have 8oz of water 6 to 8 times a day...”, which for some of us is an absolute cakewalk. Meanwhile for the remainder of us, consciously keeping track of how many cups we’ve had or just trying to finish a standard 16oz water bottle can feel like an uphill race. Whether we're medicating or just trying to make it through the day, hydration is crucial to ensure we remain alert, healthy, and happy. We all want clear glowing skin, low blood pressure, happy organs, and smooth digestion so we played with a few ways to make water interesting for those of us who cant get passed the “blah” of it. 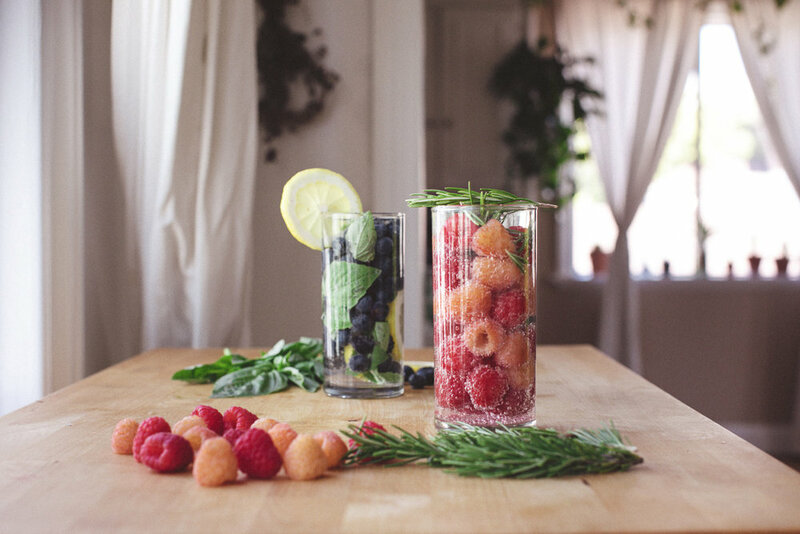 We took on the task of finding a few delicious infused water recipes to inspire you to up your intake this summer and into fall. Beautiful assortments of fresh fruit and herbs that will last from your first fill to the last before dinner. If flat water isn’t your jam, try these recipes using sparkling water. This is especially great for kids that tend to gravitate toward soda. Give some of these a try and let us know what you think! Other great ways to stay on top of hydration is to set reminders on your phone every 2 hours or so. Initially on your journey to upping your water intake is the amount of restroom visits a day. This will diminish so try not to let it discourage you. The best way to relate this is when you water a VERY dry plant. The water you provide it will drain STRAIGHT to the bottom. With time, your body will acknowledge the intake and process it accordingly allowing you to remain engaged with whatever you’re doing without worrying about sprinting off to the restroom for what feels like every 10 minutes. Try being disciplined for a week and take notice to the results both physically and mentally. Your face will be clearer if not glowing from within, your mood will be elevated due to your organs functioning to their highest potential, you might even be able to get better sleep. Let us know how it goes for you!